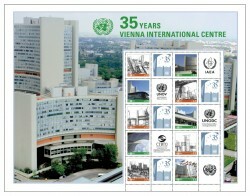 The United Nations moved into the VIC Vienna International Centre 35 years ago. The VIC was officially opened on 23 August 1979 when it was handed over to the United Nations and the International Atomic Energy Agency. Commonly known locally as 'UNO City', it has been rented to the organizations for 99 years at a symbolic rate of 1 Austrian schilling (7 euro cents) annually. This article includes a total of 1073 words.